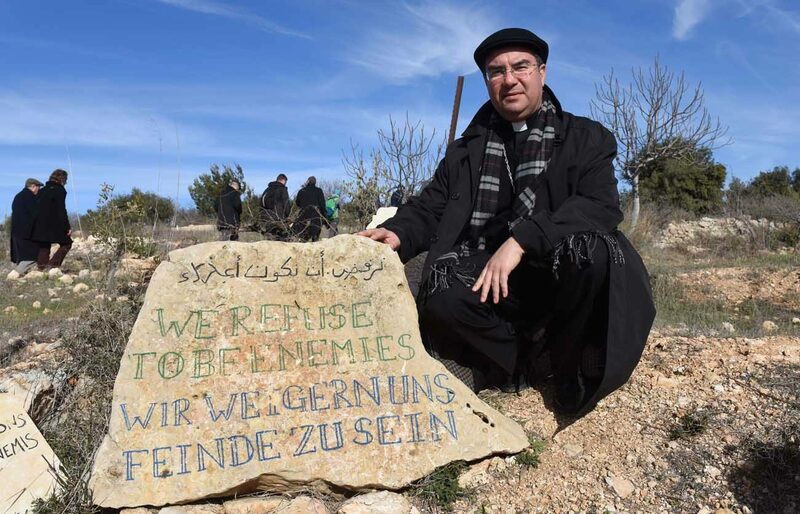 TENT OF NATIONS, West Bank (CNS) — Bishops from Europe and North America lauded this 100-year-old hilltop family farm southwest of Bethlehem as an example of the nonviolent resistance needed to oppose Israeli expansion onto Palestinian land. “This farm is what we want to encourage — a peaceful resistance … a moral voice to the international and local community,” said U.S. Bishop Oscar Cantu of Las Cruces, New Mexico, chairman of the USCCB Committee on International Justice and Peace. “Nonviolence is very important. This is what the pope has been telling us. He said that the first reaction to a violent situation is to become violent if you don’t have other values. (One of) these values (is) respect for human rights of others,” said Bishop Lionel Gendron of Saint-Jean-Longueuil, Quebec. Thirteen bishops from North America and Europe visited the Tent of Nations as part of the Holy Land Coordination, which meets every January to focus on prayer, pilgrimage and solidarity with the Christian communities in the Holy Land. When the bishops arrived at the farm Jan. 16, they were greed by brothers Daoud and Daher Nasser. Embroiled in a legal battle to protect their property from confiscation by the Israeli government for 25 years, the Nasser family has made their farm — the last Palestinian controlled hilltop in the area — a symbol of nonviolent resistance simply by remaining on their land and farming and bringing in international volunteers of all religions for their varied activities under the slogan “We refuse to be enemies.” The Lutheran brothers are also the only Christian family who remains in the area. The cooperation among people of different faiths, including Jews, created at the Tent of Nations through different programs throughout the year was an encouraging sign during a trip that included visits to the Gaza Strip and Hebron, West Bank, said Bishop William Nolan of Galloway, Scotland. Bishop Nolan was one of three bishops who traveled to Gaza. He said although they saw some new construction, he left feeling “sad and helpless” at the poverty and lack of basic commodities, mainly due to the Israeli blockade imposed following the election of the Hamas-led government in 2006. Israel, the United States and the European Union have listed Hamas as a terrorist organization and have imposed economic sanctions against them. Following their Jan. 15 visit to Hebron, the bishops criticized the Israeli “encroachment” on Palestinian land. The visit was led by a member of the Israeli nongovernmental organization, Breaking the Silence, made up of Israeli Defense Forces veterans who served in the Palestinian territories since the second intifada. “It becomes clearer that (the settlements) are not just about outlying settlements but something more systematic; more about infiltrating Palestinian land and forcing Palestinians out by making them so uncomfortable with such limited freedom they don’t want to continue living there,” said Bishop Cantu. He said the tension in the streets of what used to be Hebron’s main market area, now closed off to accommodate the security needs of some 800 Israeli settlers, is immediately noticeable. However, Bishop Cantu noted the importance of having been led by a group of Israeli veterans who have had a part in the conflict. Bishop Declan Lang of Clifton, England, said he was encouraged by the people’s faith exhibited during two separate Masses the bishops attended, one in Beit Jalla, West Bank, with Palestinians and the other in Jaffa, Israel, with migrant workers. It is up to the Palestinian Authority and the Israeli government to “demonstrate their goodwill to be trusted,” Bishop Cantu said. The Tent of Nations is an example of such goodwill, he said. Bishop Lang said the Israeli occupation not only badly affects the Palestinians but also Israeli society.